Hello Dolls! The fourth of July is just around the corner and if that means nothing to you then well, you're probably not from the United States. We like to go a little over the top when we celebrate our independence so I put together some fantastic patriotic pieces to get the celebration going! I like to be a little more subtle when I'm dressing for themed events, I would probably only rock one or two of these at a time, but if you're feeling festive go head to toe red, white, and blue! 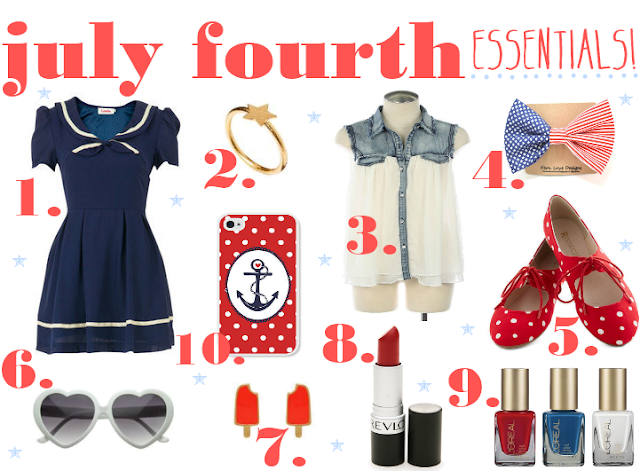 one.// This nautical dress will turn some heads at your July fourth barbeque. two.// I love this simple star ring, perfect for stacking! three.// This denim blouse is casual, cute, and will keep you cool while your shooting off fireworks. four.// This sweet little American flag bow is the perfect pop of patriotism. five.// I am swooning over these polka dot flats! six.// Don't forget your sunnies if you'll be outdoors all day, these white heart shaped sunglasses are super adorable. seven.// Kate Spade can do no wrong, Popsicle stud earrings, be mine! eight.// Matte red lipstick will add a little pow to your kisser. nine.// A red, white, and blue manicure is an easy and cheap way to get festive on the quick! ten.// Jazz up your celly with this nautical iPhone case! If you're on the hunt for some last minute yummy treats and cocktails check out these patriotic recipes! // Red, White, and Blue Ombre Layered Cake. // Fresh Red, White, and Blue Salad. // Fourth of July Punch. I hope all of you who celebrate have a fantastic July Fourth! And Happy Canada day to all of you lovely Canadians that celebrated yesterday! Wow I'm not from USA and I love this list! Specially the dress, it's so cute! Everything is so cute! I'll take one of everything. Such a great assortment! I think I'm going to buy some red white and blue nail polish on my lunch break - I do like the L'oreal ones! I love these ideas!! I teamed up with SunKissed Tangles to show two Holiday inspired looks as well. We also have a BaubleBar Giveaway running! I'd love for you to stop by!